ISLE ROYALE, MI - Necropsy results have been released for two wolves that died after being part of the early phase of the National Park Service’s efforts to bring new wolves onto Michigan’s Isle Royale. 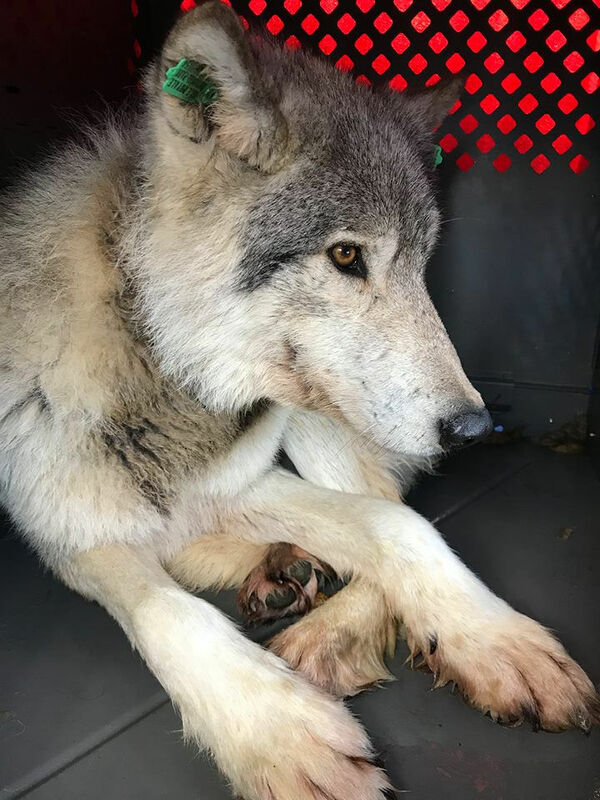 The first wolf, a female, died in late September, shortly after being captured in Minnesota and deemed fit for relocation to Isle Royale by the on-site wildlife biologists. The wolf was sedated for the trip to a holding facility where it was to be examined by veterinary staff who were assisting with the project. Once she arrived at the facility, NPS officials said the wolf’s condition deteriorated and she died, despite the best efforts of the medical team. “Necropsy results revealed no direct cause of death, but scientists think it was likely due to anesthesia-related stress," NPS staff said. Because of this belief, the wolf transfer team immediately reviewed its protocols for how the wolves were being handled, park staff said after the wolf’s death last fall. They made adjustments in the length of time captured wolves were kept in the field before they were transported, and re-evaluated how they were sedating the wolves. The female wolf’s necropsy was done at the University of Minnesota Veterinary Diagnostic Lab. The second wolf to die in the relocation effort was a male wolf found dead on Isle Royale in late October. He died several weeks after being captured in Minnesota and brought to the island along with three other female wolves from that state. The post-mortem exam revealed the male wolf died of pneumonia, “... though how the wolf developed this condition is unknown,” park staff said. They said the wolf’s tracking collar - all the relocated wolves are fitted with GPS collars so scientists can track their movements - started showing a mortality signal even though staff could see him moving around on the game cameras. Then, GPS showed his movements became limited. Park staff and partners from the Grand Portage Band of Chippewa went to the island to investigate, and found the male wolf’s body. It was sent to the U.S. Geological Services wildlife health lab in Madison, Wis., for a necropsy. “Isle Royale National Park staff are saddened by the loss of these wolves. Even with an intense planning process, wildlife handling is unpredictable. Staff are committed to doing everything possible to protect the lives of all wolves involved in the relocation process. 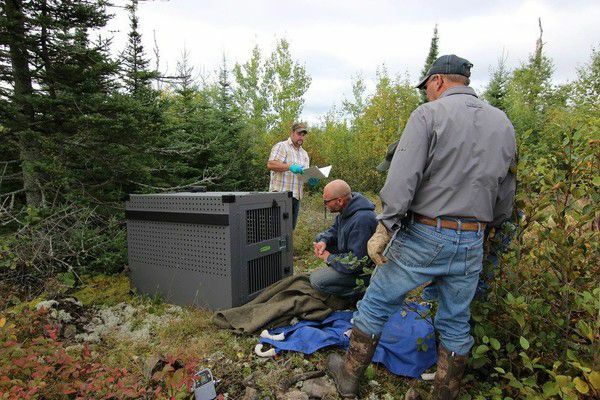 Since last fall, 13 wolves from Minnesota and Canada have been successfully trapped and flown to Michigan’s remote island in Lake Superior, which is a also a national park. The park service hopes to move up to 30 new wolves to the island over the next few years to help provide predator packs to deal with a growing moose population that’s now been estimated to exceed 1,600. As of a few years ago, the island’s once-robust wolf packs had dwindled to just two wolves. This related pair had not been able to successfully rear pups. Researchers who have been studying the predator-prey dynamics there for decades determined these last two island-born wolves would not be able to make a dent in the moose population. The push for new wolves not only is being done to balance out the moose population by bringing in some large Canadian wolves used to hunting large prey, but to give the island wolves a new infusion of DNA. With only a pair of wolves on the island, the concern until last fall was that a robust moose population could eat so much vegetation they might denude the island wilderness loved by backcountry hiking enthusiasts and park visitors.